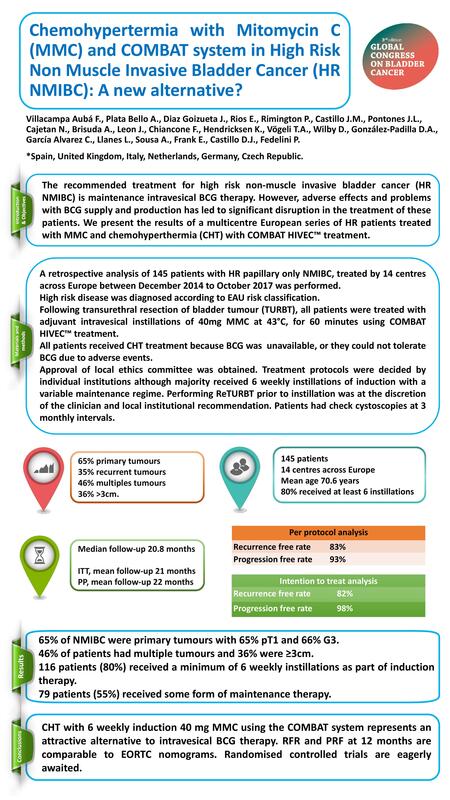 Chemohypertermia with Mitomycin C (MMC) and COMBAT system in High Risk Non Muscle Invasive Bladder Cancer (HR NMIBC): A new alternative? 145 patients were treated with the COMBAT system with a median follow up of 20.8 months. The mean age of patients was 70.6 years. 65% of NMIBC were primary tumours with 65% pT1 and 66% G3. 46% of patients had multiple tumours and 36% were ≥3cm. 116 patients (80%) received a minimum of 6 weekly instillations as part of induction therapy. 79 patients (55%) received some form of maintenance therapy. In the Intention to Treat analysis (145 pts), mean follow up 21 months, recurrence free rate (RFR) was 82% and progression free rate (PFR) to T2 was 98%. In the Per Protocol analysis (at least 6 instillations, 116pt), mean follow up was 22 m, RFR was 83% and PFR to T2 1 was 93%. RFR at one year follow up was 87,3%. CHT with 6 weekly induction 40 mg MMC using the COMBAT system represents an attractive alternative to intravesical BCG therapy. RFR and PRF at 12 months are comparable to EORTC nomograms. Randomised controlled trials are eagerly awaited.